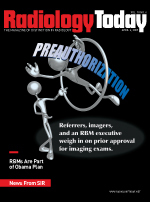 Phillip M. Boiselle, MD, and colleagues reported that 58% of radiologists at their institution said they had repetitive stress injury symptoms and 38% reported a prior diagnosis for the condition. The report, “Repetitive Stress Symptoms in Radiology: Prevalence and Response to Ergonomic Interventions” was published in the August 2008 issue of the Journal of the American College of Radiology. The survey of 107 faculty, fellows, and residents working in Boston’s Beth Israel Deaconess Medical Center isn’t the definitive study on repetitive stress injuries among radiologists, but it supports what they know: Repetitive stress is a real issue among those working in a PACS environment. An ergonomic environment can improve repetitive stress injury symptoms, according to the Boiselle. The survey found that 70% of respondents who received ergonomic chairs reported symptom improvement, as did 80% of those who received ergonomic workstations and 80% who underwent ergonomic training. While appropriate chairs and tables are a huge part of ergonomic planning, a radiologist’s hands are the most tangible interface between rad and machine—where the rubber meets the information superhighway. Anyone who spends long days in front of a computer understands the aching of hands, wrists, and fingers. (That includes radiology magazine editors.) Taking care of your hands is an important part of ergonomics. 1. Warm up and stretch your hands with some exercises and repeat during breaks. I’ve found these exercises to be a boon. A couple times each day, I rotate my wrists and fingers over their full range of motion in both directions and stretch my hands and fingers—when I’m writing about ergonomics and repetitive stress injuries, it’s probably twice an hour. Those 60 seconds are time well spent. 2. Go on a mouse hunt. There are numerous mouse styles available; try some and find one that works for you. Logitech, Contour Designs, and Connectland are among the manufacturers of 10-button (or more) mouses. Creatively utilizing those programmable buttons can save keystrokes. Some mouse devices can be programmed for specific programs, so the buttons perform different tasks as you toggle between your PACS and speech recognition software. On the other end of the spectrum, if your mouse isn’t too heavily programmed, you can switch mouse pointers periodically. 3. Investigate alternate input devices. If you utilize speech recognition, using a headset in addition to the handheld microphone can be easier on your hands. Tablet devices and foot pedals are other possibilities. 4. Fully utilize macros or other keyboard shortcuts to reduce the number of keystrokes you make. There are keyboard utility programs at www.freedownloadscenter.com/Utilities/Mouse_and_Keyboard_Utilities that let users fully customize their keyboard. If you’re a speech recognition user, make sure you learn to fully customize your microphone commands. If you work in a hospital environment, it’s a good idea to check with the IT department before you add things to your workstation. They’ll be far less angry if you’ve asked before some free download crashes the system. 5. If you’re able to use your mouse with either hand, change hands periodically to save keystrokes. Though many people lack the ambidexterity to use this tactic, it’s worth a try. 6. Consider your posture when working. Proper seating posture helps avoid problems with your forearms and hands by placing them in an appropriate position in relation to the keyboard and mouse. Like Boiselle reported, adjustable workstations really do make a difference if used properly. • Arm Across Chest: Place your right arm across your chest and your left hand just above your elbow. Pull your arm across chest and hold for 10 seconds. Relax and then repeat on other arm. • Arm Massage: Roll up your sleeves. Using your thumb and fingers, massage both sides of your arm from elbow to hand. Repeat on other arm. • Finger Stretch and Clench: Spread the fingers of both hands as far apart as possible. Make a tight fist and squeeze. Repeat several times. • Flying Fingers: Let your arms hang by the side of your chair. Wiggle your fingers for 15 seconds.